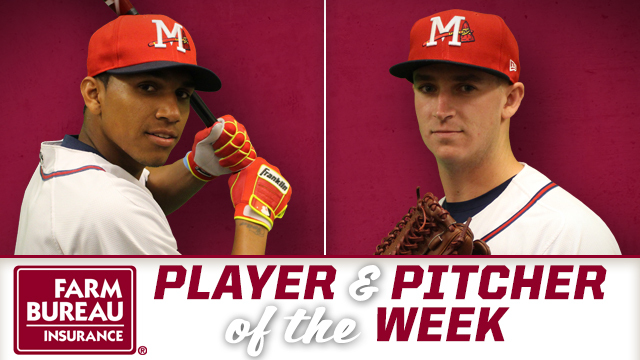 PEARL, MS -- Infielder Johan Camargo and RHP Evan Phillips have been named Mississippi Farm Bureau Player and Pitcher of the Week for the week ending Sunday, July 31. Camargo, 22, posted a .333 batting average (7-for-21) in six games during the week. The Panamanian had three doubles, a triple and two RBI. On the season, Camargo is hitting .282. Since the all-star break, he's posted a .359 average with 11 doubles, four triples and 19 RBI. His best numbers are against lefties where he's currently hitting .308 compared to .276 against right-handers. He leads the Southern League with 15 sacrifice bunts this season. Camargo was signed by the Braves as a non-drafted free agent on July 2, 2010. Phillips, 21, picked up a win in each of his two relief outings this week. He gave up just two hits while striking out six in five innings of work. Since joining the Double-A club at the end of June, Phillips is 4-1 with a 3.44 ERA in 11 appearances out of the M-Braves pen. Before the promotion from High-A Carolina, he was 2-1 with eight saves and a 1.27 ERA in 21 relief appearances for the Mudcats. Opponents were hitting .180 against the right-hander-lefties hitting just .120 against him. The Maryland native was selected by the Braves in the 17th round of the 2015 draft out of UNC Wilmington.